There's something beguilingly attractive about end-of-the-world scenarios. 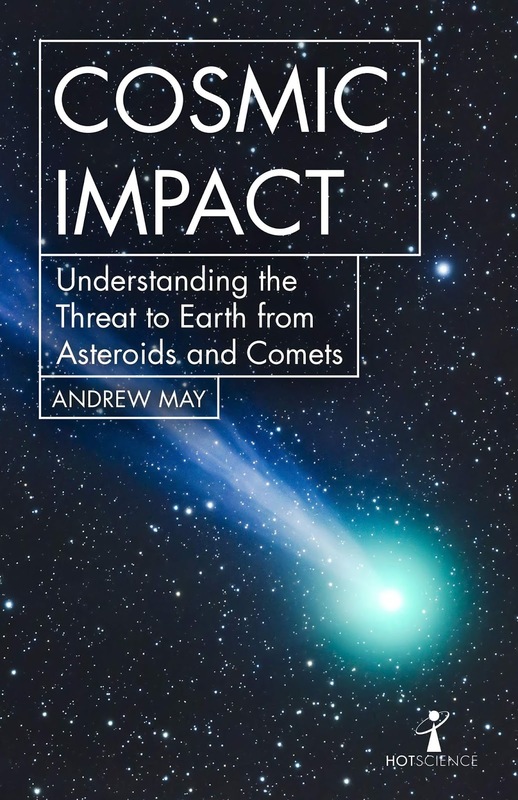 In Cosmic Impact, Andrew May takes on the granddaddy of them all - an asteroid or comet hitting the Earth. We're familiar with the idea that the dinosaurs were wiped out by the fallout of such an impact (with some volcanic help), but there's a much bigger picture to be had, and May puts it across well. 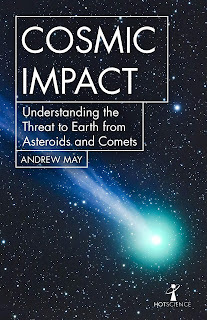 This short book is ideal to get a good overview of the subject without having to delve into too much technical detail - and May makes it approachable by giving the subject context from the many science fiction and popular culture scenarios (the Simpsons feature on page 1) where something hits the Earth from outer space. In fact it's arguable that the science fiction examples of attempts to predict and divert future impactors have had a direct influence on what has happened in reality in setting up early warning detection of incoming potential impactors. As well as the science of bodies hitting the Earth - which is rather more complex than you might think, given the Earth is moving as well, and involves four different types of possible orbit with the exotic names Amor, Apollo, Atira and Aten - we also see what has been done in recent years to spot potential near misses and how, in principle, we might be able to do something to avoid a collision. Unlike Hollywood's usual approach, this is unlikely to involve blasting an asteroid to pieces (which then might all impact on us), and is more likely to involve changing the asteroid's approach speed so that it simply misses where we're going to be when it gets near. Of course we also get plenty on the history of the discovery of what's out there, the distinction between asteroids and comets and even the unlikely thesis that the path of the asteroid that wiped out the dinosaurs was influenced by dark matter. I don't always get much out of pure astronomy books - I usually prefer physics - but there was enough context here (along with that nagging implied threat to humanity's future) to keep me engaged throughout.